I received an advance copy for free through GoodReads’ First Reads. 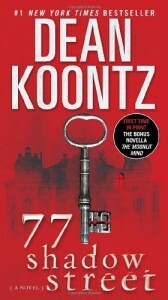 I read a lot of Dean Koontz’s books during my high school and college years, but have read almost none in the last 10 years, so I’m not really current on the Koontz oeuvre. But even to me, this felt like a lot of stock characters recycled to perform a lot of unnecessary tasks, making the book longer and less interesting than it needed to be. We spend a lot of time learning about characters who ultimately have very little to do in or with the story, while others more (and sometimes less) integral to the plot pop up halfway through with little explication. Personally, I could get past bland characters if they were only serving as grist for a powerful storytelling mill. I mean, if something genuinely scary happens to a character, it’s going to be scary regardless of who it happens to, right? And the book does kick off fairly fast, but after the first couple chapters I just wasn’t feeling the tension. It takes too long for the stakes to be raised, as we keep switching from one pointless character to another to experience the same level of anxiety or suspense from 10 different perspectives. So you slog through 400+ pages of that, and suddenly—and here comes the really spoilery part—the bland characters have saved the world by assassinating scientists for their ideas (because knowledge and ideas die with the scientists, right? ), and then two of the most stock bland characters (“ex-military guy” and “single mom with inner strength who really loves her darn-good kid”) are married and having a kid together and the stepson is so thrilled to finally have a real dad and a dog. And that vision of domestic bliss is how you know they’ve really saved the world, and not just postponed the inevitable or something. You’ll probably be too busy saying “WTF?” to barf. Overall, it felt like a thin and sloppily assembled plot, more tied to finding an unusual explanation for an apparent haunting than exploring any number of the bigger and far more interesting ideas popping up at the resolution of the story. I’m giving it two stars because it wasn’t that painful to read, and if you shut your brain off at the end and/or move on immediately to another book it won’t seem that bad.